In this video we look at a joint-lock takedown from Kururunfa kata. The “upper x-block” cuts in and bends the enemy’s arm, and then the turn and drop puts pressure on the shoulder which will force the enemy to the floor. As with all martial methods, great care needs to be taken in practise. Always train under the direct supervision of a suitably qualified and experienced person. This video looks at bunkai for the sequence in Nijushiho / Niseishi that begins with a rising elbow. That elbow is then followed by either a “lower block” and “hook punch”, or a “low punch” and “lower block”, depending on the style being practised. The video looks at bunkai for both variations. While on the surface the two variations seem quite different, I would suggest that they are alternate illustrations of how the arm can be manipulated in order to further create and maintain a position of advantage. 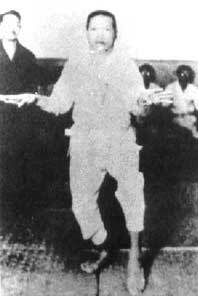 Nijuhachiho is said to be an Okinawan kata based on White Crane Kung Fu. The version discussed in this video is the one taught by Hirokazu Kanazawa 10th dan. The name Nijuhachiho means “28 steps”. It is different from the kata Nipaipo that is practiced in Shito-Ryu. Nipaipo also translates as “28 steps”. This video shows bunkai for the opening sequence of Tekki Sandan / Naihanchi Sandan kata. The video also shows how the discrete motions can be combined together into a single drill. I am of the view that the Nidan and Sandan versions show alternative expressions of the core principles of Naihanchi Shodan (the original stand-alone kata once simply known as “Naihanchi”). Here we see variations on the limb-control and trapping methods that are first introduced in Naihanchi Shodan / Tekki Shodan. Thanks for your support of these videos! This video shows limb-control drills (trapping, locking, gripping and re-directing) for the first quarter of Kushanku / Kanku-Dai / Kosokun. The video begins by showing the two core drills for the opening sequence and the following knife-hands. The video then goes on to explain how the methods in the drill should be varied and recombined in differing orders. The objective is the never the drill. The objective is to internalise the methods within the drill so they can be applied freely and effectively as the situation dictates. In this video we look at how the kubotan can be used to augment methods found in Naihanchi / Tekki Shodan. The kubotan is a short staff which is often made into keyring for everyday carry. The legality of the kubotan is something you need to check in your locality. In the UK, you could not carry the kubotan in public. Section 1 of the Prevention of Crime Act 1953 prohibits the possession in a public place of an offensive weapon without lawful authority or excuse (potential use in self-defence is not considered a good reason / excuse). 1 – Learning, training and refining the solo form. 2 – Training the bunkai (applications). 3 – Exploring the principles demonstrated by the bunkai so we can adapt and vary (i.e. internalise sound combative habits). 4 – Gain live experience of freely employing the methods and principles of kata. A new video discussing stances! If you like this one, check out the iain abernethy smart phone app for new exclusive video on karate grappling! More “Iain Discusses” videos to come! Coming very soon are “The four stages of kata” (public) and “Unravelling kata hand positions” (app only). In this video we look at bunkai for the first two sequences of Naihanchi Nidan / Tekki Nidan. We have put the methods end to end in this drill, but it is obviously important to practise the methods individually, in alternative sequences, and in other drills. It is my view that the methods of Naihanchi Nidan / Tekki Nidan (and Sandan) build upon the methods encapsulated in the core kata of Naihanchi Shodan / Naihanchi Shodan. In this instance we see some examples of how to fight around the neck clinch that Shodan taught us to use. This video shows at a basic kata-based limb-control drill. The methods contained within the drill can be found in many kata including Gekisai-Dai-Ni, Chinte, Chinto / Gankaku, Niseishi / Nijushio, etc. It is important to remember that this is just one of many drills, and the methods within need drilled individually, in alternate sequences, and in differing contexts. It is also important to drill the methods live and give them free-rein in live practise.